Steve has a past in the DC area – a good past, that is. So while we were here, he wanted to visit his old stomping grounds from many moons ago (32 years). Back then, he was in the Air Force, stationed at the Pentagon – but one of his part-time jobs was as the wedding coordinator at the Old Post Chapel on Fort Myer Army Base. Things haven’t changed much inside! He told me the job was a civilian position that he “just lucked into” from another Air Force buddy, and he loved it. He worked every weekend for three years and conducted over a thousand weddings. No wonder he seemed so calm at our wedding! On the day we arrived, at least two military funeral services took place at the chapel. 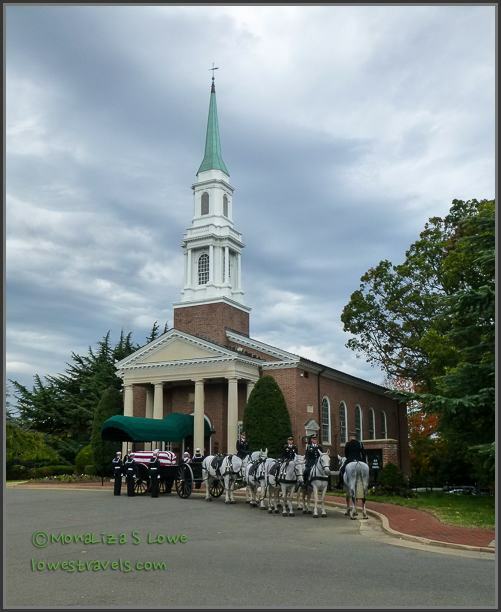 It is used extensively for funerals in cases where the deceased is buried at Arlington Cemetery, which is just adjacent to the chapel. A funeral was underway when we arrived. 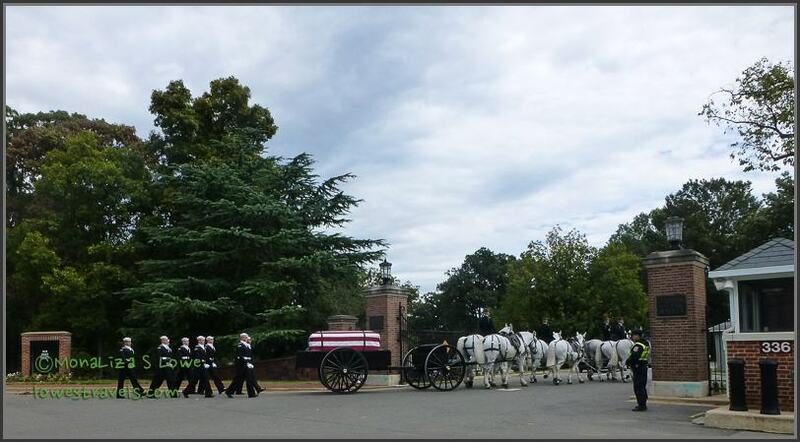 A Navy funeral procession enters Arlington Cemetery from the chapel. 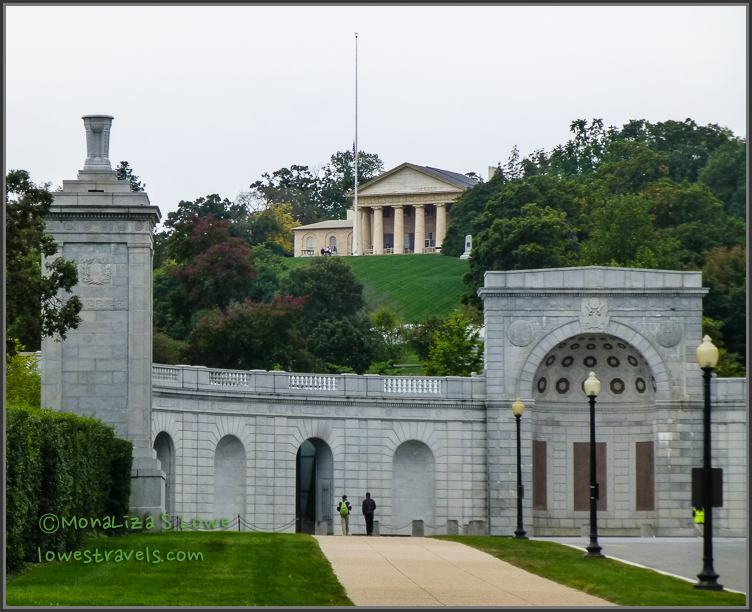 Following the procession, we walked into Arlington Cemetery and made our first stop at the Arlington House – currently known as the Robert E. Lee Memorial. Within the little museum at the back of the house, we learned that Arlington House was once the home of Confederate General Robert E. Lee. His family abandoned the house in 1861 and was eventually confiscated by the feds due to non payment of taxes. 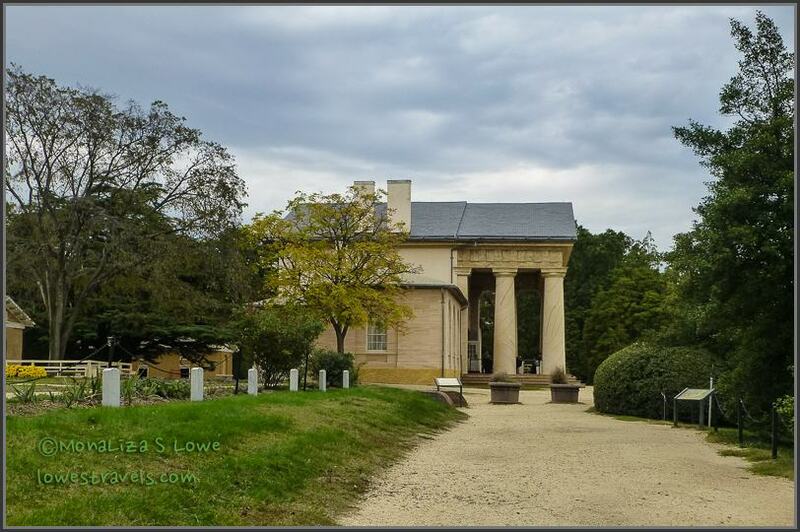 The house and 200 acres of surrounding land were set aside as a military cemetery in 1864, and the original 22 headstones of soldiers can be seen placed around Mrs. Lee’s flower garden. Arlington House. The garden is surrounded by 22 headstones. 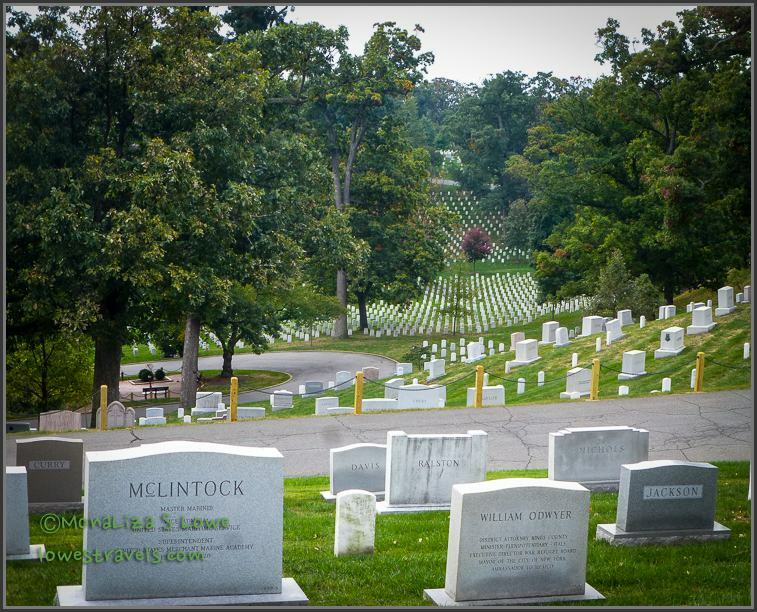 Arlington National Cemetery has undergone many expansions over the years, and it now encompass 624 acres. It is considered the most hallowed burial ground in the United States. Washington, DC viewed from Arlington House. 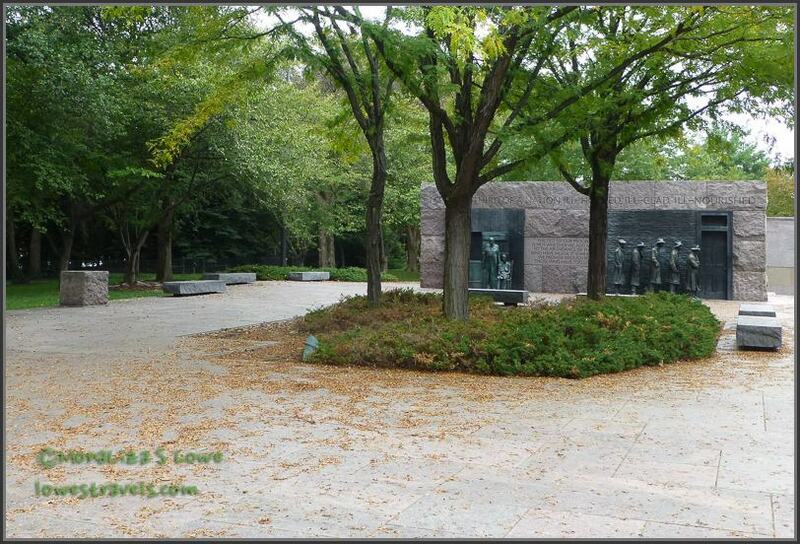 Note that the JFK eternal flame is undergoing an upgrade in the foreground. 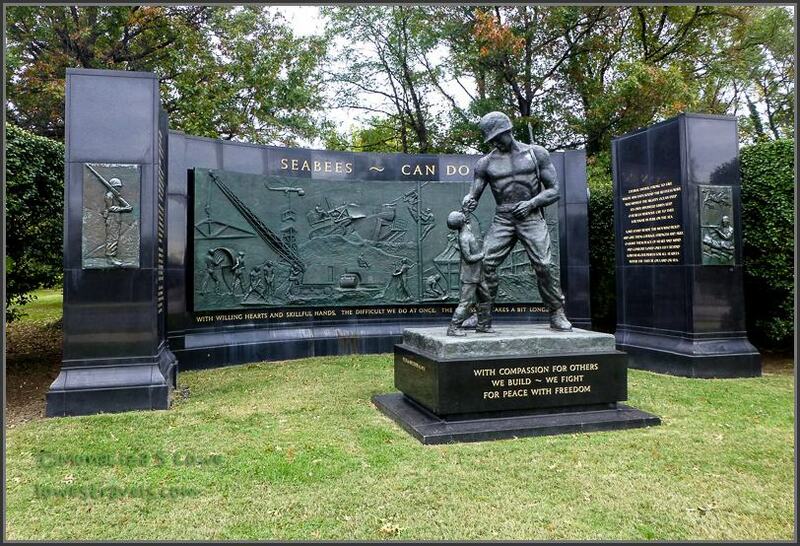 …and the Seabees Navy Memorial. 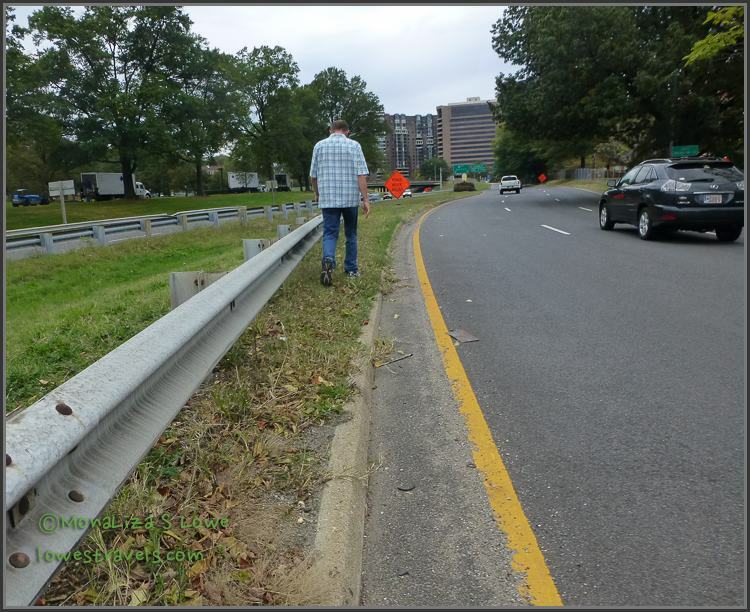 Then we walked down the Esplanade and along the George Washington Memorial Parkway to Arlington Blvd. Anyone with common sense would drive to the U.S. Marine Corps War Memorial, and the drivers were probably wondering what the heck we were doing out there blazing our own trail. But it was a beautiful day and we walked several miles – who needs a car? 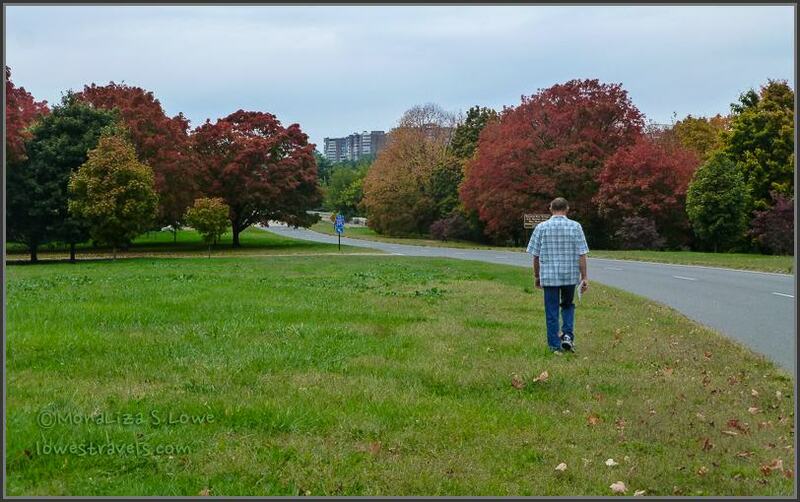 As we walked along the busy George Washington Memorial Parkway, I was ecstatic as I captured some beautiful fall foliage along the way (the blog’s current header was taken along Memorial Drive). There was a stretch of road where there wasn’t enough room to walk safely, so we just trudged along between the beautiful trees on the carpet of leaves. Sidewalk? We don’t need no stinking sidewalk! 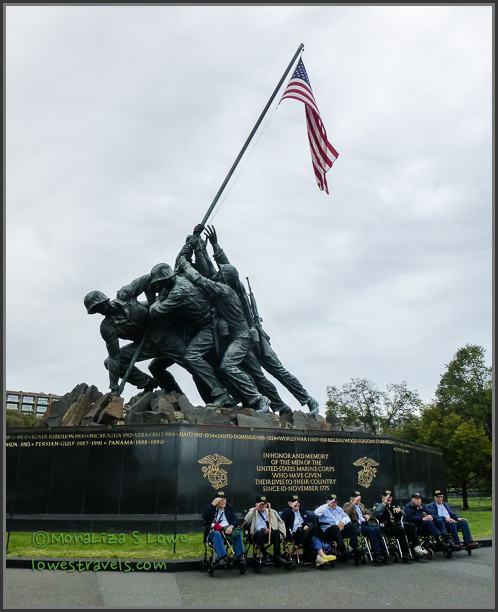 Marines who fought at Iwo Jima. Now these are real heroes! Getting back to our car was a bit easier, as we located another gate into the cemetery and headed through Arlington National Cemetery to the Old Post Chapel. On another day we visited the mansion of the father of the United States, George Washington, in Mount Vernon. While taking the tour of the mansion and the surrounding grounds, we learned that he designed and oversaw the expansion of Mount Vernon. At the educational center and museum, we also learned that the founding father never attended college. Instead, he educated himself via a lifelong pursuit of self-learning. In the three hours we were there, we learned a great deal about the general and first president, and we understood why he was a founding father of our nation. Among other things, farming was one of Washington’s true passions. He invented the 16-sided barn at Mt. Vernon, which was used for grain processing and storage. Horses trotted around the circular slotted wooden floor on top of harvested wheat to separate the grain from the stalk. Once the heads of grain were separated from the straw, it would fall through to a granary below and stored there until milled. At that time that was considered very ingenious. 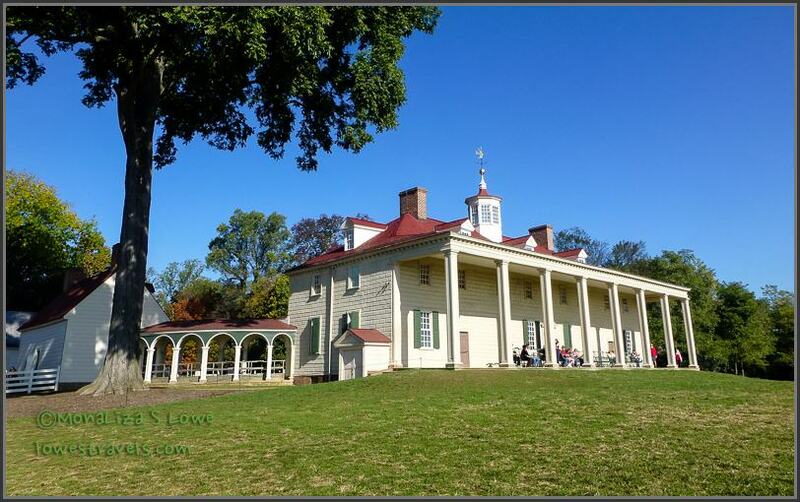 To learn more about the life and works of George Washington, click here. Our stay in DC also included some socializing. We went to Baltimore to have lunch with Steve’s longtime friend that he met while stationed here. I also met with my friends from Cebu, Philippines that I’ve known for many years. As you can probably tell by now, we had an action-packed visit in and around the nation’s capital. Whew! after our 9th day here we were exhausted and ready to move on, not to mention we were beginning to feel the fall chill in the air. 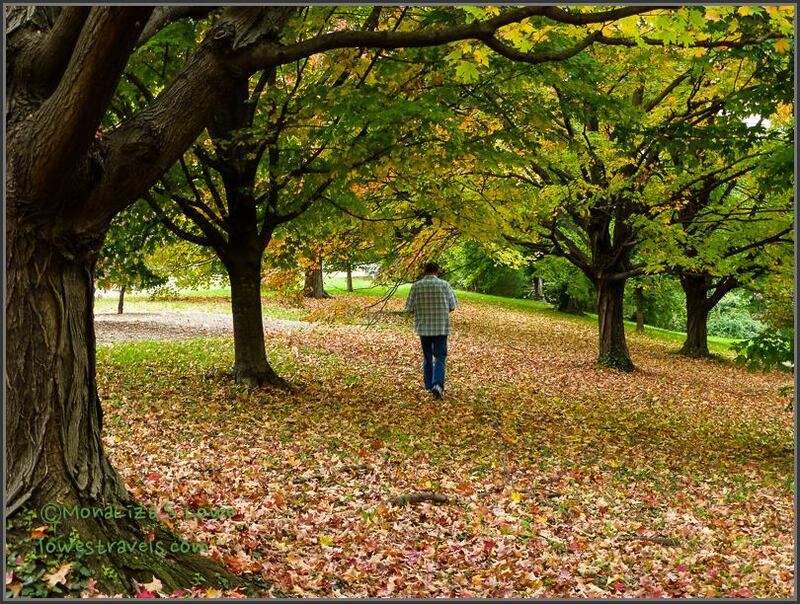 Our base camp was at Cherry Hill Park in College Park, MD, (Steve’s review is here). 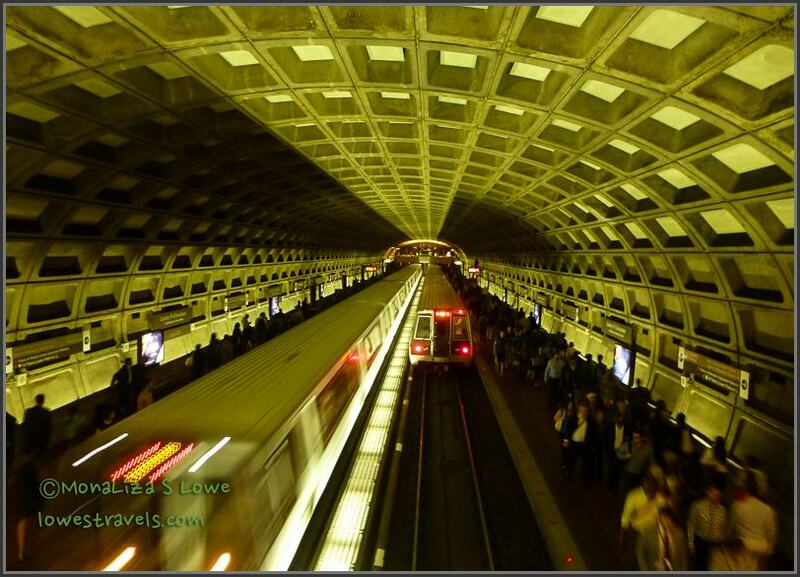 It’s the most convenient RV park to Washington, DC, with easy access to the excellent Metro system. Next Up: Oh no, another history lesson? Does this man look confused? For once he isn’t, thanks to the simplicity of the DC Metro system. Once again our jello-style planning has been tested. Lucky for us, with this lifestyle we can change the course as often as needed to fit our wants and needs. 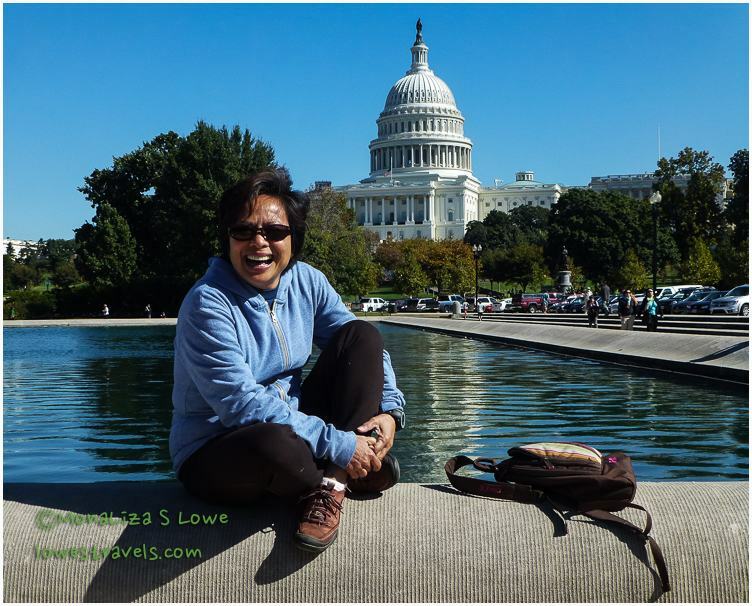 Prior to our arrival in DC, we had shortened our 10-day stay to a week due to the government shutdown. But when the government got their act together on our 3rd day here, we changed it back to 10 days. Even then we knew there’s no way to see everything here in just 10 days, so we prioritized our wish list and went from there. 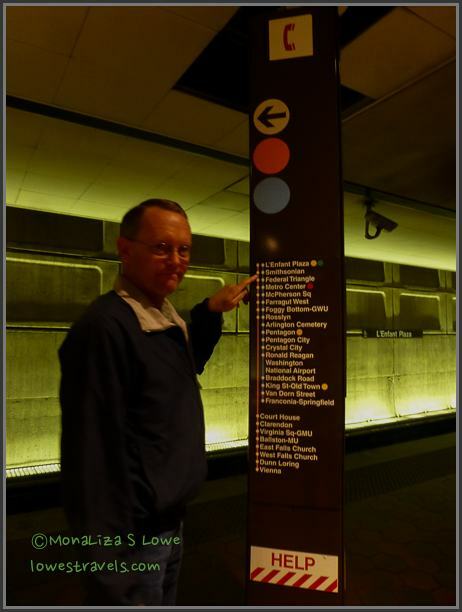 The Metro system is the way to get into DC, and on four days it was our mode of transportation as we hit the National Mall. 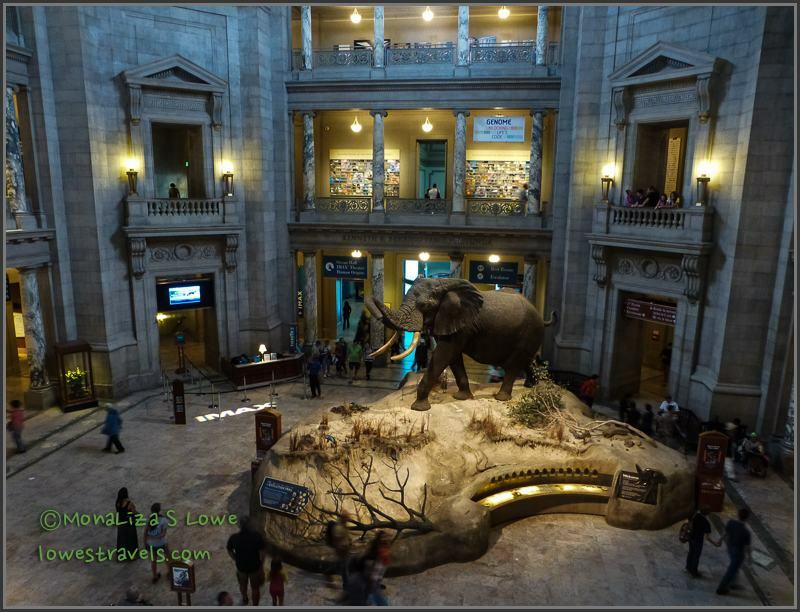 We explored not only the iconic monuments and memorials, but most importantly the re-opened (and free) world class Smithsonian museums. I promise to post only the highlights of our gawking and learning escapades. 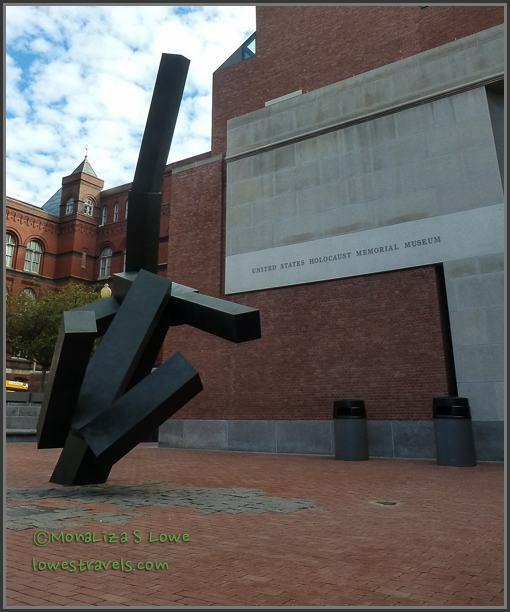 Our visit to the US Holocaust Museum was a compelling emotional experience. We thought we could just breeze through it, but we couldn’t. It was a sobering visit, and a good place to learn about that dark time in history. Photography is not allowed, but what struck me the most was the room containing thousands of pairs of the victim’s shoes, and the “tunnel” with pictures of so many of them, which made it very real. We were drained and exhausted after three hours of intense reading, listening and watching videos. 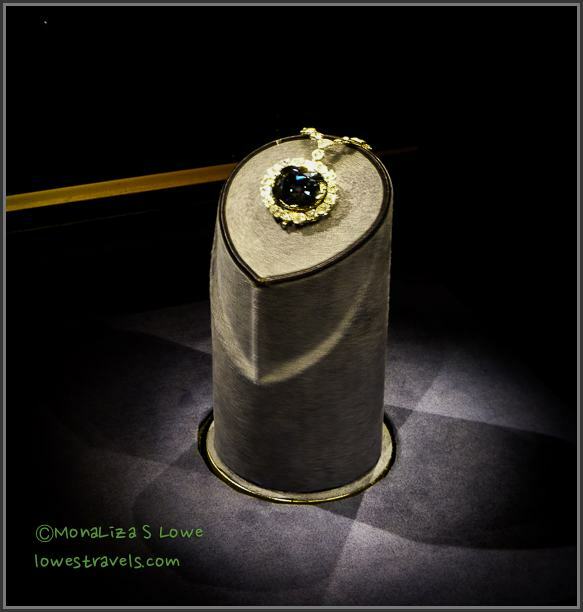 At the Natural History Museum, Steve made sure I got to see the dazzling 45.52-carat Hope Diamond, known for its flawless clarity and rare deep blue color. The Natural History Museum is a family favorite, but we mostly just checked out the Gem and Mineral collection. It took hours just to examine the various mesmerizing gems and minerals of all shapes, sizes, colors and forms. We have already been to several Air and Space museums – the McMinville Air Museum in Oregon, the National Naval Aviation Museum, in Florida and the Space Center in Texas – but of course the Smithsonian Air and Space Museum is the granddaddy of them all! With Steve’s passion for all things that fly, this one was at the top of his list. Although he was stationed in DC during the early 80’s and had been to this museum several times back then, so many changes and upgrades have occurred that he hardly recognized the place. 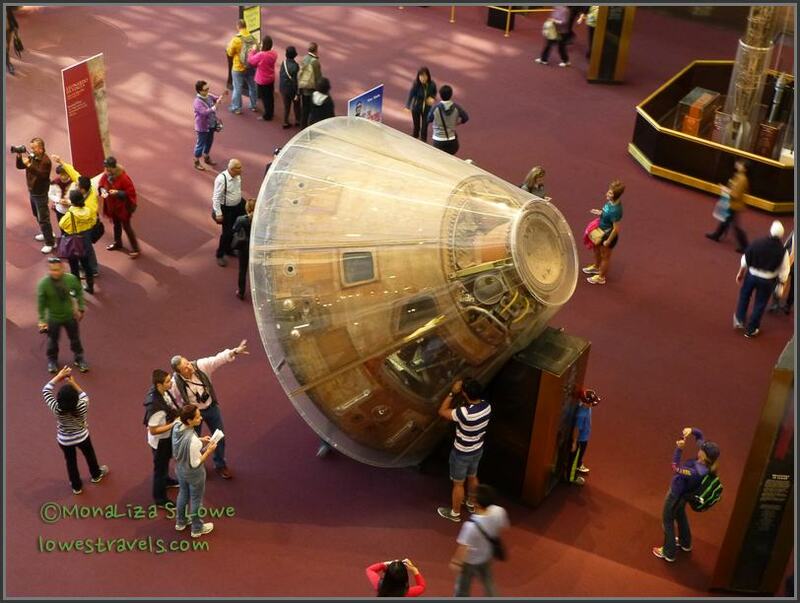 The actual Apollo 11 command module – good stuff! 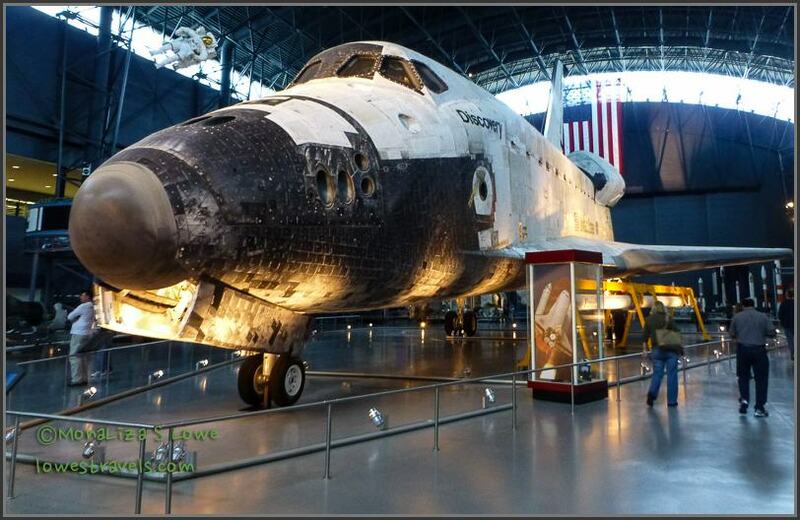 Because it is the world’s largest collection of air and space vehicles, the collection has been expanded to two locations – the original museum on the National Mall and the other at the massive UDVAR-Hazy center next to the Washington-Dulles Airport. Of course, we had to see both of them! Concorde – the first commercial supersonic airliner. Of course, what we saw here were not replicas, but the real historically significant aircraft and spacecraft. Standing literally under the Space Shuttle Discovery was awesome – knowing that it flew beyond the limits of our earth. And there was the Enola Gay, the actual aircraft that dropped the atomic bomb on Hiroshima. We also saw the Air France Concorde, the Lockheed SR-71 Blackbird, the Apollo 11 command module, the actual original Wright brother’s flying contraption, and so much more. Overwhelming! I had to agree with Steve, this place is extraordinary. Standing next to so many historic displays took my breath away! 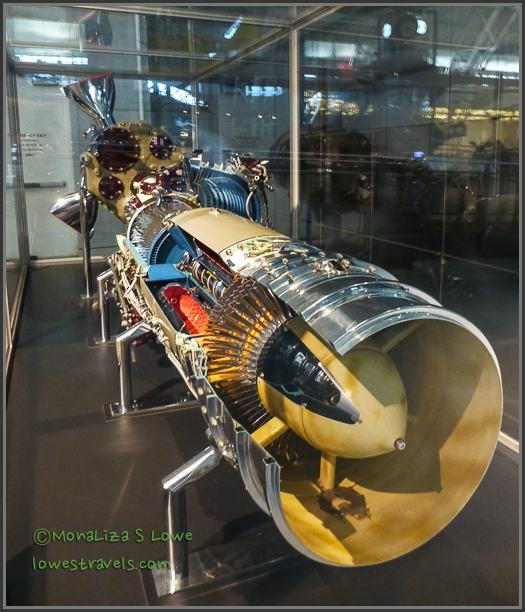 This got Steve’s blood flowing – a massive Pratt & Whitney R-4360 turboprop assembly. From airplanes and spacecraft, we came back down to earth at the National Health and Medicine Museum. This often overlooked and off-the-beaten-path museum has several collections of morbid anatomy on display. 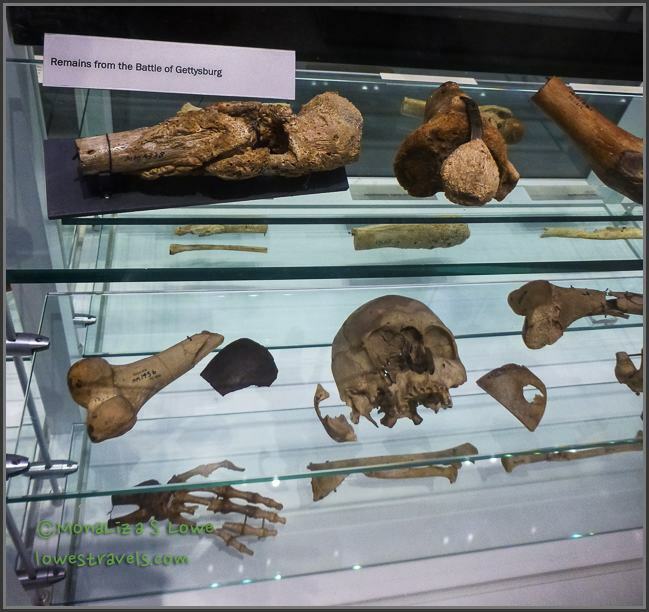 The collection has real human remains (bones, tissues and parts), and an interesting display that discusses facial reconstruction. 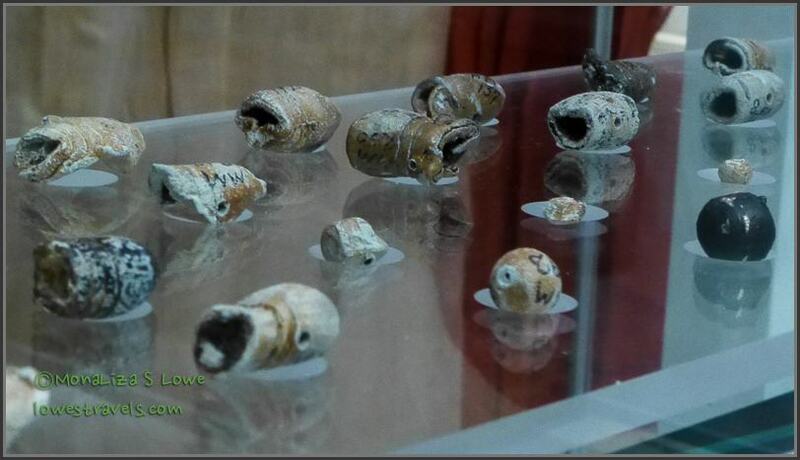 There are also exhibits that display gruesome injuries from the battlefields of several wars and describe the medical techniques used for them at the time. The emphasis here was on military medicine, documenting the effects of war wounds and disease on the human body and the remarkable changes in American medicine over the past 150 years. There was a display that marked Abraham Lincoln’s 200th birth anniversary, including items associated with his last hours. The physicians who cared for him and the bullet that killed him were on display. We found this museum to be unique and well worth a look – even if you aren’t into medicine. 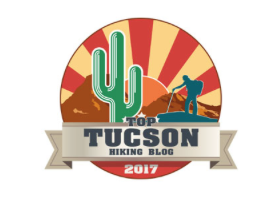 Thanks to our best bud Don for recommending another winner! 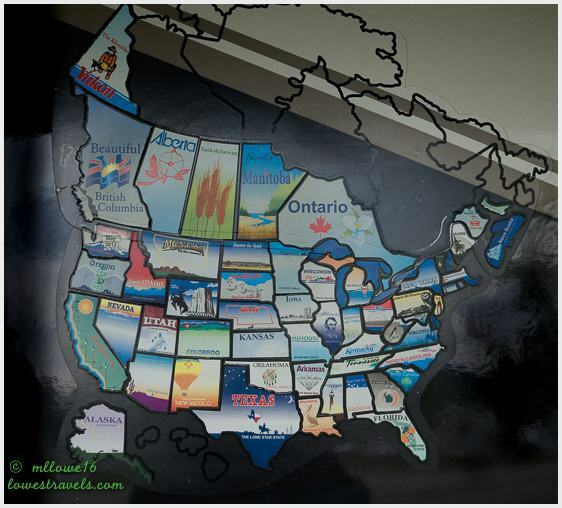 We noticed a National Building Museum on our map and decided to see what that was about. 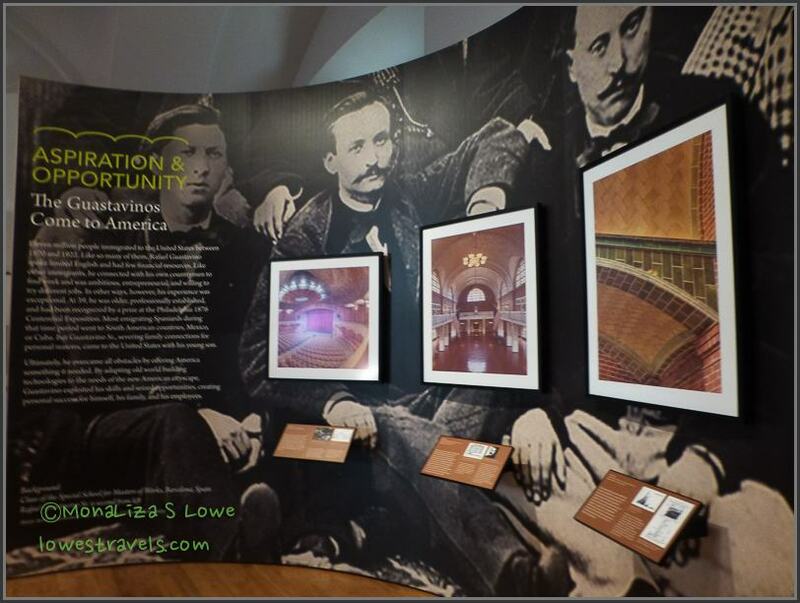 It included a display called “Americas Great Places, the Guastavino family”. We had not heard that name before, but their architectural legacy can be seen under the lofty vaults and domes of this beautiful building. There are several iconic structures attributed to the Guastavino’s, notably Grand Central Terminal, the Boston Public Library and the U.S. Supreme Court building, to name a few. 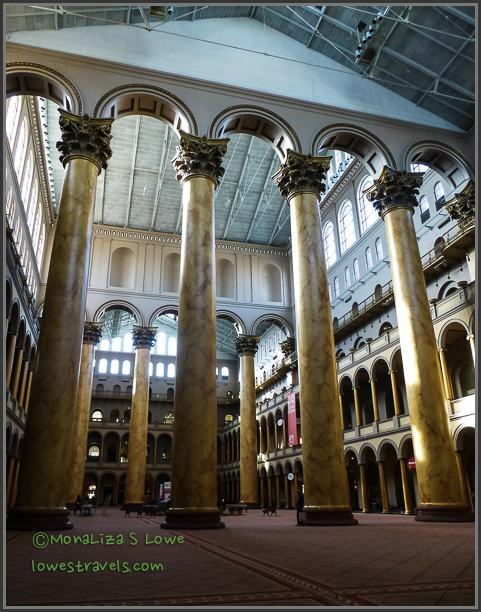 Lobby of National Building Museum – that ceiling is WAY up there! We also dropped by the National Archives, where, along with a big crowd of kids, we managed to peek at all the original Charters of Freedom in America. No photography allowed, but to just see the original 200+ year old Declaration of Independence, Constitution and Bill of Rights sort of capped our own history trail education. We happened to get inside the National Archives, along with a bunch of kids. 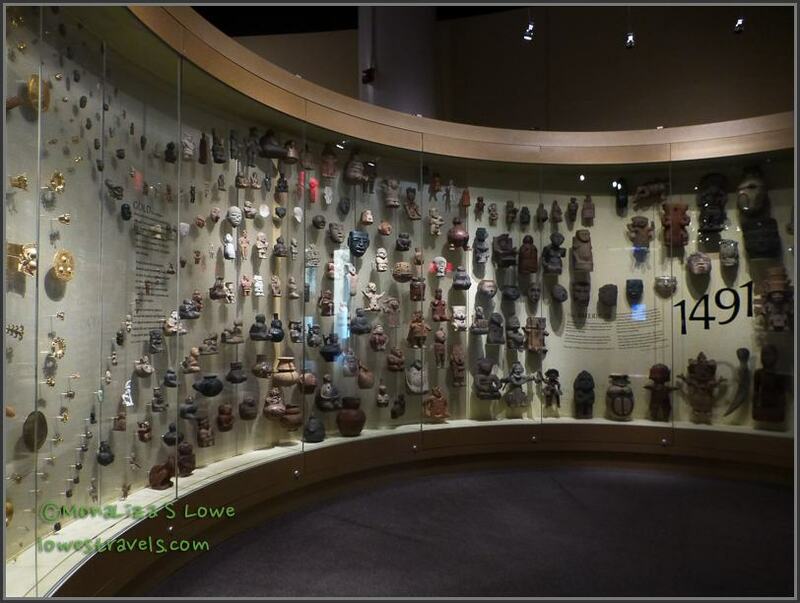 We spent a few hours at the National Museum of the American Indian and observed that the museum is really a cultural celebration of Indians from the past and present. Eight galleries recount the history of individual communities from their perspective. And, they have a very good (although a bit pricey) cafeteria there. Thanks to Greg and Michelle for telling us about this one! As an afterthought we stopped by the National Art Gallery, West building. Not being art lovers, we just breezed through and then out we went. 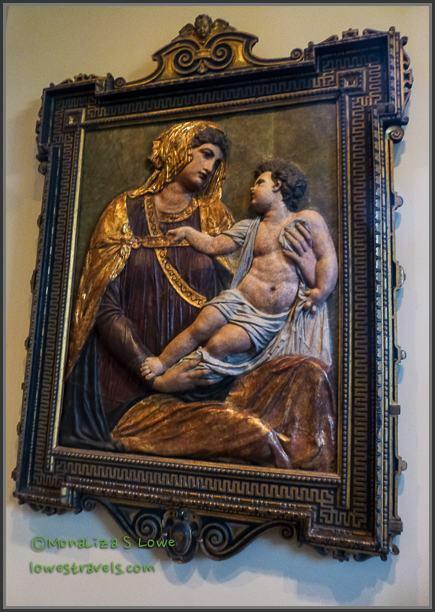 But not before I snapped this Madonna and Child, a painted and gilded paper mache and stucco, circa 1550. Madonna and Child, circa 1550. Believe me, that was a lot of museums to visit! After four solid days we had headaches from learning more than we wanted to. We also became veteran Metro riders and walked miles and miles. Our legs and brains hurt, yet we had barely scratched the surface in this city. It seems like going through all of these world-class museums could take a lifetime. There is something for everyone in the nation’s capital, and worthy of a visit – despite the bickering politicians. The food trucks were back – steak sandwich, please! Reflecting Pool with the Washington Monument (still under repair) in the background. A happy person takes a break from her arduous touring. Steve’s all ready for our tour of the BEP! When we arrived at College Park, Maryland (our home base during our visit to the nation’s capital), the government shutdown was still underway. 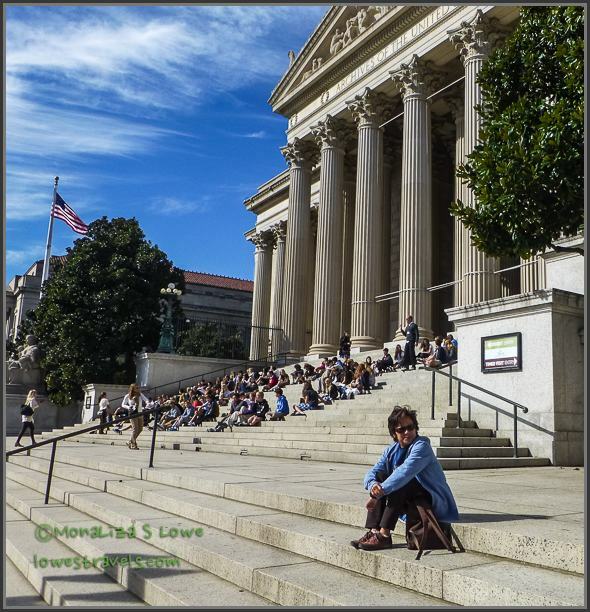 We all know Washington, DC is a city rich in museums, monuments, attractions and more. Despite the shutdown there were several interesting things for us to check out. The famous open-air memorials were still somewhat accessible, and several of the non-Smithsonian museums were happy to welcome us. We hate to admit it, but the closure actually worked well for us. There were no crowds, and it was easy for us to do our non-government exploring on the first two days. Then, when the government re-opened, we were able to hit everything else as other tourists began coming back into town. Sometimes timing is everything! Sorry, no take out allowed! Our first stop made Steve happy, as he had been excited to visit the Bureau of Engraving and Printing (BEP) – which was not affected by the shutdown. The BEP is one of the largest currency printing operations in the world, with facilities in Washington, D.C. and Fort Worth, Texas. All U.S. currency is printed at one of these two facilities. Photography was not allowed while we were on the actual production floor. 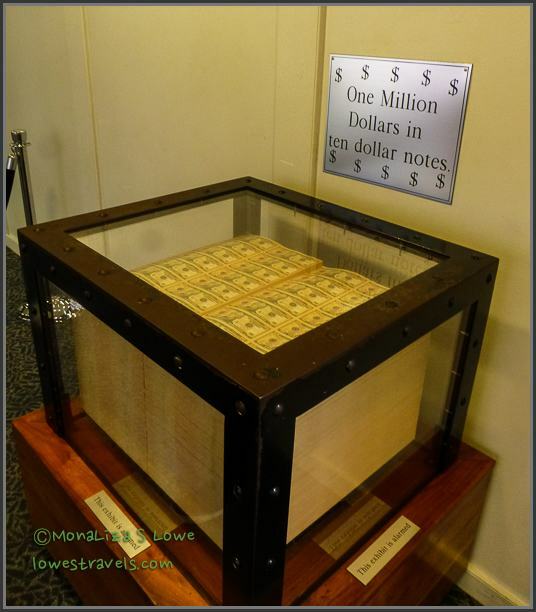 We witnessed the printing of millions of dollars as we walked along the galley. During the tour, our guide asked us to pull out a dollar bill and study it as she explained the printing process and security measures taken to prevent counterfeiting. There is a whole lot that goes into the printing, but I won’t bore you with those details. Instead, lets have some fun – take your dollar out, and let’s decode it. Then you’ll know what all those seemingly random letters and numbers mean! The letter “B” inside the circular seal represents the Federal Reserve Bank issuing the bill – in this case, B=New York (A=Boston; C=Philadelphia, etc.). A number is printed in four places around the face of the bill, corresponding to the letter in the circle. For example, printed here is number 2 because B is the second letter in the alphabet. The note’s serial number also begins with a letter corresponding to the issuing Federal bank, again it’s B in this instance. The serial number ends with a letter which identifies the number of times that the BEP used the sequence of serial numbers – A is the first time, B is the second time, C is the third time and so on. The “H3” on the upper left quadrant represents the position of the bill on the 32-note printing plate it was on. The “H90” on the lower right quadrant represents the specific printing plate used. If this bill had been printed in Forth Worth, Texas, then “FW” would have been printed next to the plate number H90. Is “FW” printed on your bill? Redesigned hundred dollar bill began circulation on Oct 8, 2013. Paper money is not made of paper, but of cloth – 75% cotton and 25% linen – that is why it survives in the washing machine. It cost 5.4 cents to produce a $1 bill and 12.7 cents to produce a $100 bill. Estimated life span of a dollar bill is 5.9 years, while a $100 bill survives about fifteen years. The Secretary of the Treasury is responsible for the final choice of currency designs, including the portraits. On the reverse side, the bald eagle seal contains 13 stars, 13 bars on the shield, 13 arrows, 13 leaves, 13 berries and 13 letters in “E Pluribus Unum” on the ribbon. Have you seen the redesigned $100 bill just now coming into circulation? If not, it looks like the one pictured above with its two distinctive security updates – the Liberty Bell in the inkwell and the blue 3-D security ribbon running down the note. We left the Bureau of Engraving and Printing feeling pretty smart about what’s in our wallets. Not only that, I learned that I’m about $1,374,750 tall in $100 notes. Hey, I’m rich! I look rich here – if only it were true! Have I bored you yet? 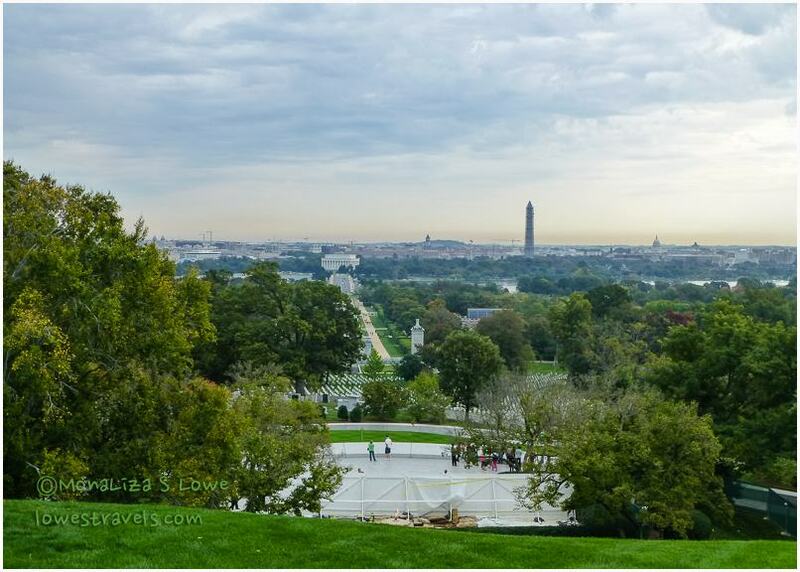 Okay, then lets move outside to see the sights at the National Mall, the tidal basin and some other popular spots in DC. The National Mall, and pretty much everywhere else we went, looked like ghost towns on the day we were there – the last day of the shutdown. Although we loved the light crowds, the downside was that the public restrooms were locked. Also, the food trucks were nowhere to be found, and we heard some of them are great and wanted to try them out! 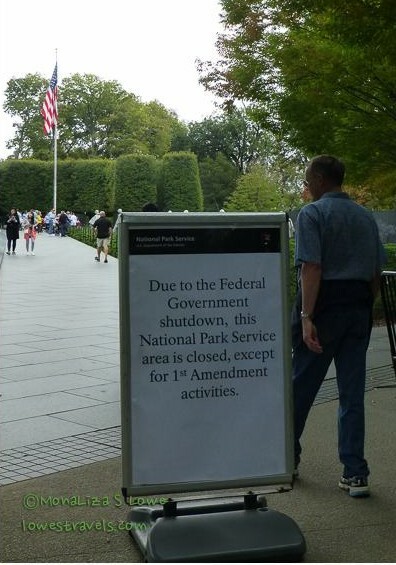 Despite the barricades placed at the memorials, visitors pretty much ignored them and just went in – like this tourist, who must be exercising his 1st Amendment rights. Hey, he looks familiar! The news was reporting that veterans and supporters were taking down barricades around the WWII memorial and dropped them off in front of the White House. Thanks to them we just walked around the remaining barricades and visited them, too. The police stood right there and didn’t say or do a thing. 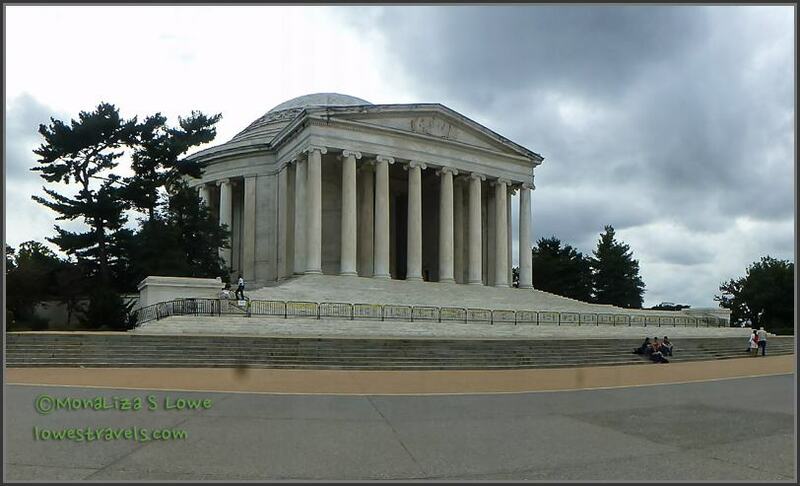 …and a barricaded and almost deserted Thomas Jefferson Memorial. Oh well, we had both seen most of the memorials before so this was close enough. 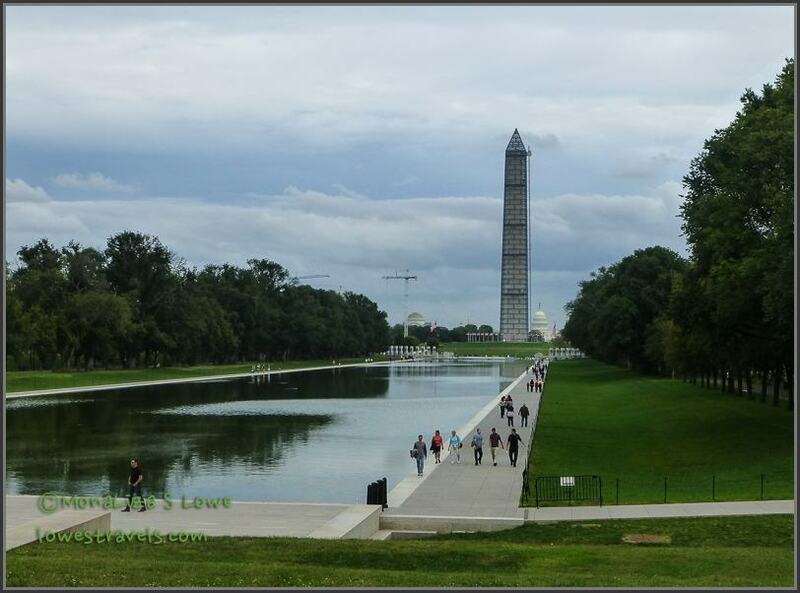 Everyone knows that visiting the National Mall and the memorials can involve a lot of walking. Although the sky was cloudy, it was warm and a beautiful day to roam around town. 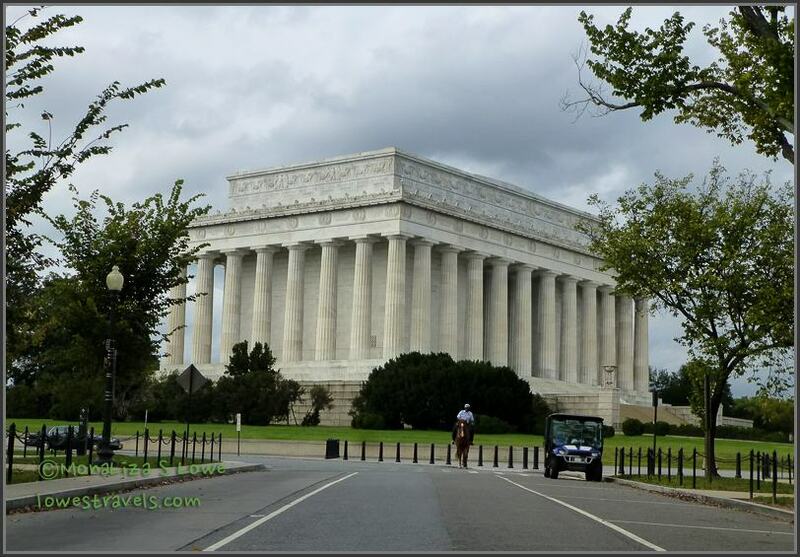 There were no tour buses running because of the shutdown, but we prefer to walk anyway and knocked out over 7 miles! We noticed on this day (Oct. 16th) that there was a lot of air activity. 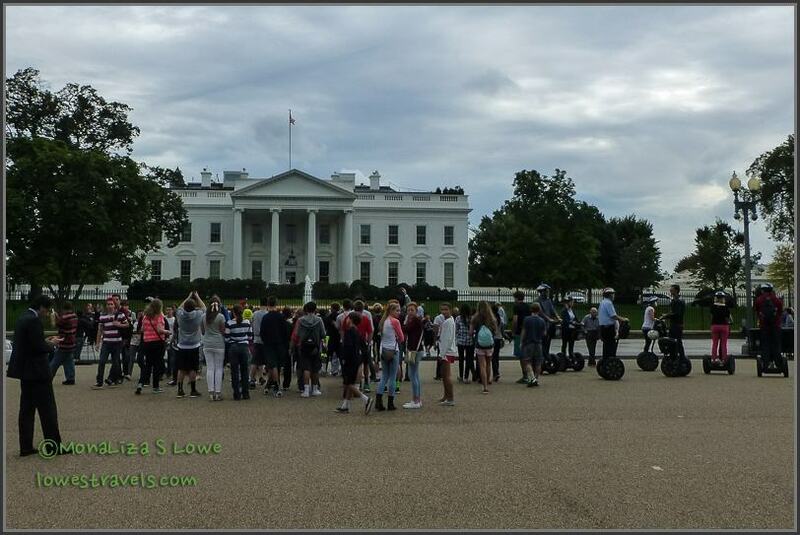 We saw the president’s “Marine One” helicopter and several others fly over a few times, shuttling back and forth from the White House to various locations. We learned later in the evening that the partial shutdown had been lifted and was over. Yay, the government is finally “functioning” again! To the museums we go! Next up: So many museums, so little time!